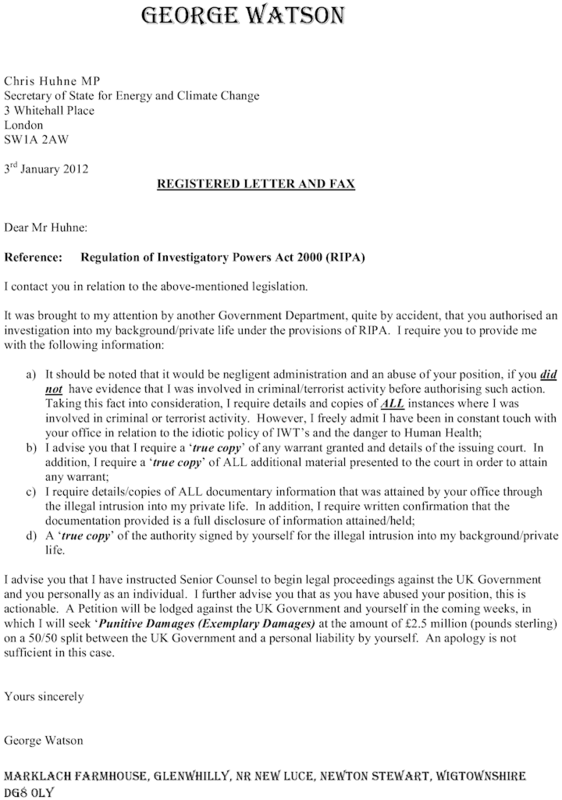 Legal Advisor to the European Platform Against Windfarms (EPAW), George Watson is being investigated by the UK government under special powers which are only to apply to criminal/terrorist activities, claims the Platform. A letter, reproduced below, has been sent to Chris Huhne, Secretary of State for Energy and Climate Change, denouncing this improper use of the legislation, and announcing legal proceedings against the UK government. A formal complaint has been made to the Metropolitan Police. According to EPAW, Mr Watson was also harassed by a police officer who visited his home in a Scottish rural area … on Christmas Eve! Mark Duchamp, Executive Director of EPAW, declared that he was respectfully asking UK government Ministers if they intend to investigate and harass other members of the public who oppose the destruction of the British landscape, the killing of protected bird and bat species, and the deterioration of the health of wind farm neighbours. Mr Watson’s only crime, he said, was to have found legal flaws in the way the UK government’s energy policy is being applied. EPAW claims that wind farms are ineffective, immensely expensive, and destroy jobs in the rest of the economy (1); that they are also seriously harming human health, resulting in home abandonment, or worse (2); and finally that they are killing protected wildlife into extinction (3). In the circumstances, concludes Duchamp, the 514 associations from 23 countries represented by EPAW would like to know why their members deserve to be investigated and harassed by the authorities, using special powers reserved for criminals and terrorists. George Watson’s letter is appended. It’s about time the little people used the law to their advantage. The big people have been doing it forever to our detriment. I hope you will keep us informed of how this and your own case turn out. In the meantime three cheers for George. Tallbloke, for too long the alarmist and political activists have been allowed to lie, influence the public and pass restrictive laws for no good purpose and harm to the public. Legal action seems to be necessary to make them accountable. This post http://joannenova.com.au/2012/01/that-famous-email-explained-and-the-first-volunteer-global-warming-skeptic/ highlights what Phil Jones and and his fellow travellers have been upto. Huhne knows very well what has been going on at UAE/CRU. He is one of the activists that are directing the political agenda. A conviction would at least remove him from influence and possibly enlighten the public to the harm being done. I have sent a letter to EPAW expressing my concern and asking them to pass on my best wishes to George. I know how frightening and intimidating it is to get raided by the police without proper explanation of the reasons supporting the warrant. It makes you feel like the main character in a Franz Kafka novel. In George’s case, he has managed to discover a name behind the intimidation and this enables him to act. If as ordinary upstanding citizens we are to be treated as terrorist supects in our own country using legislation designed for entirely other purposes then the people (ab)using the power can expect some comeback. I wonder how the decision about if to prosecute Chris Huhne and his wife regarding the speeding ticket fracas is progressing? Government or police abuse of power must be resisted on every occasion as, even if they get away with it, they will think twice before taking action against other dissenters. Just how widespread is this abuse? how many people on the sceptical side have been subjected to this without even being aware of it? This is extremely disturbing imho. Did we morph into a soviet style system while we were asleep? …the use or threat is made for the purpose of advancing a political, religious (racial) or ideological cause. The effect of this legislation was to give governments unprecedented powers (previously only used in time of war), and to reduce the citizens freedom and rights of privacy. The wording of the act is loose enough to allow many interpretations of what ‘terrorism’ is. Thank you George Watson and Tallbloke for sharing this information with us. I suspect there may be more instances in the future where similar action is required to stamp out this misuse of power. We are fortunate via the internet to be able to voice such concerns. So equally we must fight to ensure that the internet allows such visibility and is not subject to unreasonable control or censorship. Thanks for this info, and I do hope Mr Watson will be successful. At the same time, I wonder if there are others in this country who have been treated in this way, but who haven’t made this known publicly. All right, two (you yourself and Mr Watson) is not exactly a big database, but it strikes me that, compared to the ‘big names’ like Anthony or Steve McIntyre, you are not global big players (or so the buffhuhnes think). Therefore they went for you, in clear cases of intimidation. I hope this case gets worldwide attention – buffhuhnes are not known for grasping what the internet is about. How many moving parts has a hydraulic 100 MW power generator?= One. But as there is no wind all the time at least 4 windmills are needed to achieve the yield of one (However Finland figures on windmills yield reach only 2.35%: About 40 of 1 MW windmills to achieve 1 operating MW). In 2003, after the 11 September attacks in the US, the UK agreed new extradition laws with the US. Often justified as being necessary for anti-terrorism, but critics warned that they could easily be abused. If you wiki “The Nat West Three” you’ll see these powers being used to extradite people accused of financial crimes [Enron, I think], not terrorism. Well, we were warned. How do you shut off the water? How do you control the flow of water to sync the generator? How many turbines used for 100MW? Wind is not better, There are impacts in all generation.there are impacts in mechanical failure. Much better is energy efficiency improvements to reduce power needs. Start again by reading the comment. Then look at the picture. This pattern of intimidation against anyone who questions the CO2 scare is amazing in its scope. It is not limited to ordinary citizens. Even respected scholars and scientists are subjected to harassment, loss of their jobs, blocking of advancement, etc. if they dare speak out. People at various stages of their schooling risk receiving poor marks if they don’t toe the line. Please keep us updated on this. This is disgusting. I am going to meet my MP about this matter. Good. As it also seems as though he’s going to be prosecuted for attempting to pervert the course of justice, he may well have to answer this case from Wormwood Scrubs. Couldn’t happen to a nice bloke. Great news go for it George. My best wishes to you.